A few months back Chumby announced the Chumby One. We got ours in just before Thanksgiving and I am loving mine. Let me tell you what a Chumby is exactly. It is an internet connected, touch screen, wifi alarm clock with 1,500 different widgets you can add to personalize it and use however you see fit. Sarah got me a Chumby last year for Christmas and I have really enjoyed it, but it is kind of a pain to take it back and forth to work everyday if I want to use it in the office. Plus Sarah had stolen mine so that she could have multiple alarms at night when Lyla nurses without changing it every time. I wanted a digital picture frame for the office, but when I saw the price drop on the new Chumby I knew it would be a digital picture frame and so much more. So I told Sarah that the new Chumby One was only going to be half the price at $99 and it does pretty much everything that the old Chumby did. The only major changes they made were taking away one speaker, one USB port, and it is no longer a beanbag device, but more of a standard alarm clock look. Other than that, the functionality is the same, and they even added an external volume knob, and an FM radio. 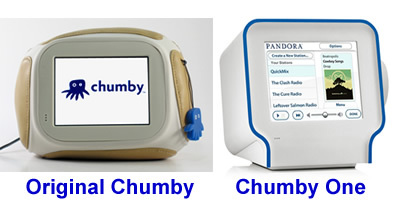 You can see from the picture below the difference in the old and new Chumby’s. The old one is more of a play toy, but higher priced, and the newer one is cheaper, but the same insides for the most part. Sarah got hers early last week and I got my original Chumby back to use as my alarm clock, and mine came in the day after Thanksgiving. I have been using it at work all week this week and I couldn’t be happier. I can plug in my iPhone via the back USB port and listen to the music directly off of it while it is being charged. I can have a slideshow running on the Chumby’s screen from my Flickr Photos, or Facebook photos at the same time of my baby girl. I’ve also got it setup to listen to Love 89, Life 88.3, NPR, and TWIT.tv. Not only that, but it has Pandora built in and lots of other streaming radio options. It is a really slick device that I am getting more and more dependant on and really loving. And there are tons of other widgets you can add like webcams, games, news, mail, social applications, really whatever you need. It is an extremely cool little device that does so many things. Plus if you are the type that likes to go in and hack, it is totally hackable since it is really just a custom Linux build. So, if you are looking for a gift for someone, or think this sounds like something you would like, then check out Chumby.com and see if it will fit your needs.